Yeah, that’s right, I put Roger Moore below Connery and Craig. But we’ll get there. First, travel! This is a two-for-one post, because yesterday we were too sleepy for blogging. We had an easy travel day, leaving Minneapolis in the evening and arriving in Amsterdam in the morning. 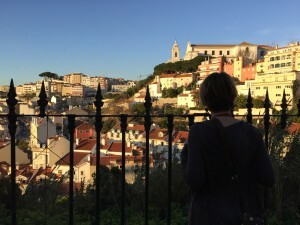 A three hour flight got us to Lisbon, and a cheap cab ride got us to our AirBnB. We’re staying just outside the “Barrio Alto” neighborhood. The waterfront was packed with people just hanging out. “Just hanging out,” is the sort of thing Europeans tend to do very well. We, being not-Europeans, hung out for a little bit, then got restless and kept walking. We wound our way through, and up, the city, into the Alfma area, where we got a cheese-and-meat snack. 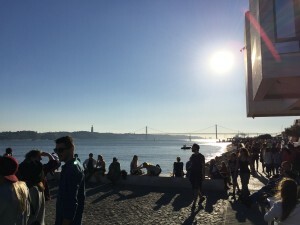 Lisbon is gorgeous and fun, and very different from other European cities. It’s compact, relatively quiet, and very friendly. There is a notable mish-mash of antique tiles and graffiti adorning every surface. The streets in the historic portions of town are narrow and winding and make for an adventure in getting lost. After our snack, we made our way to dinner, at a fish restaurant near the train station. It was excellent, though we were starting to fade a little bit by that point. 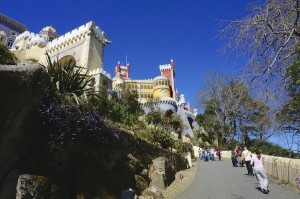 Monday morning, we took the train out to Sintra, an easy 40 minute ride from Lisbon. 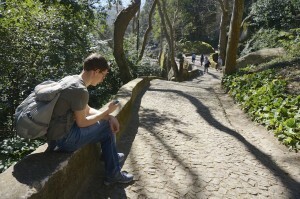 Most sites in Lisbon are closed on Monday, so a trip to Sintra made a lot of sense. Sintra is an odd place. It’s a UNESCO World Heritage site, and is the type of many-layered place that you can’t find in the States. It’s been, variously, home to Moors, Monks, Kings and Tourists. Fueled up, we embarked on the hike up to the Moorish Castle. 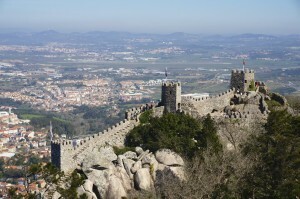 Actually, make that the “Moorish Castle.” While there was indeed a Moorish castle here, the present-day ruins were recreated by King Ferdinand II. You’re given free-reign, and just get to wander around, climbing where you wish. It’s gorgeous, with views out to the Atlantic. After Castle-ing about for a while, it was on to Disneyland. But first, a brief stop so Colin could register for classes for the Summer, as the registration window opened at 1:00 pm. Right, now, on to Disneyland! The Pena Palace is an odd place. 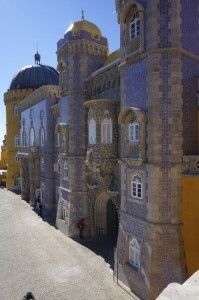 You can read the Wikipedia article to understand just how Disney-esq it is (or just how Pena-Palace-esq Disney is). Definitely odd. But good odd, not like weird wooden carvings of babies odd. The king who built the palace was indeed a relative of the king who built the castle that inspired Disney. The exterior and interior are equally mesmerizing and honestly don’t look a thing like any other palace either of us has visited. It was a baffling turn into every room. It’s a very large site, with the opportunity to wander as you wish. A large park surrounds the palace and is covered in winding paths. 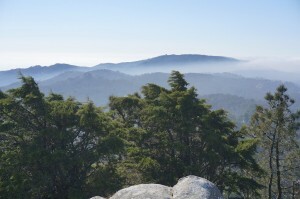 We climbed to the highest point, the Cruz Alta, for a view of the fog rolling in from the Atlantic. 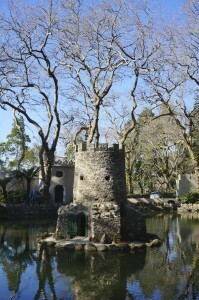 Some of our favorite parts of the grounds were the fern garden and the duck houses. The ducks have some seriously nice houses. Duck palaces maybe. 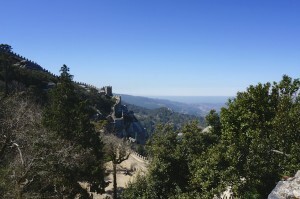 By now, it was time to head back to Sintra, and back to Lisbon. We took a “short cut,” which turned out to be a bit more of a “slightly creepy alley with high walls on either side and oh crap now it’s filling with water” cut. No pictures of this one, because, you know, wet. We did have a delightful meal in Sintra where we enjoyed the Portuguese version of tapas. So far, we’ve managed to try a few kinds of fish, including bacalhau, the national favorite dried-salted-cod. Portuguese food is simple and hearty, and we’re quite happy. The Portuguese people have all been friendly, and tolerant of our faltering attempts to speak Portuguese. Tomorrow our plan is to explore the neighborhoods of Lisbon and enjoy the history of the city. Also pastries, but more on that tomorrow.